On September 23. 2009, The American Bar Association Section of Environment, Energy, and Resources released a publication outlining the current rules of obligations for corporations that contribute to climate change to disclose to shareholders, the risk that climate change litigation presents, in the United States. Strict rules that demand that such risks be clearly presented to shareholders could have the effect of stopping companies from engaging in activities that contribute to climate change. Such rules about the disclosure of risks of U.S. companies are governed by the Securities and Exchange Commission. More specifically the current rules are governed in Item 101 and Item 303 of Regulation S-K of the Securities and Exchange Commission, which requires that such risks be presented to shareholders. This included the risk new of climate change litigation, and not only the current risks of litigation within the United States but also the risk U.S. companies that operate within other countries such as the risk of participating in the Emission Trading Scheme in the EU. But the main risk lie in the costs that may arise from potential litigation law suits such as the ones listed below, and the ones that will be further researched by Claimer.org. This has been long in discussion such as in 2004 when a group of 13 pension funds managing more the 800 billion dollars stated that many companies are not fulfilling their duty to disclose the material financial risks associated with climate change in their Management Discussion and Analysis (MD&A) within their company's annual financial statements and during shareholder meetings. These pension funds demanded that the Securities and Exchange Commission deem that Item 101 and Item 303 include the necessity of stating that climate change litigation lawsuits to be presented as a financial risk to shareholders. U.S. State Treasures such as Connecticut State Treasurer Denise Nappier and Maine State Treasurer Dale McCormick as well as the State Treasurers of New Mexico, Oregon, Maine and Vermont agreed and stated that the regulations of the Securities and Exchange Commission should not only require that these risks be stated in the MD&A, but that companies that pollute the air with Greenhouse Gases (GHG)s must also undertake details analysis of the risks and disclose it within the MD&A of the financial statements. Similarly Greenpeace also tried to pursue a similar path in 2007 in New Zealand by directly informing companies' CEOs about such risks. On page twelve of this PDF from climatecasechart.com you can see a list of such lawsuits that have arose in the United States and that the U.S. State Treasurers also cited as examples of such risk. Steadfast Ins. Co. v. The AES Corp. 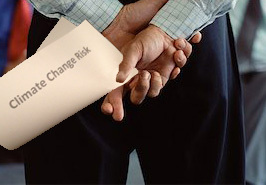 These types of lawsuits could help to detour investment in harmful industries by transferring the damages back to the business not taking due diligence in preventing Greenhouse Gases (GHG)s. Similarly, showing shareholders that such damages to the environment will affect the profitability, because the risks of these costly legal proceeding will have a similar impact of affecting potential profits. Thus these obligations to disclose to shareholders the risk of climate change litigation may cause shareholders take these potential cost into account and to choose to invest in industries that do not cause GHGs and do not contribute to global warming.